If your ads are still not shown after implementing the solutions on this page and you are using WP QUADS PRO then open a support ticket and we sort it out for you. WP QUADS makes it extremely easy to add ads into ads but there are a few cases which could result in non showing ads on your website. I am going to show you the possible reasons why AdSense ads are not showing on your website and what you can do to resolve this issue. These tips can be used for other ads as well and they are not limited to AdSense only. You can use a separate plugin to add the activation code into head of your site. Learn how to do that. Note, that it take up 24-48h until ads are shown after doing the steps above. 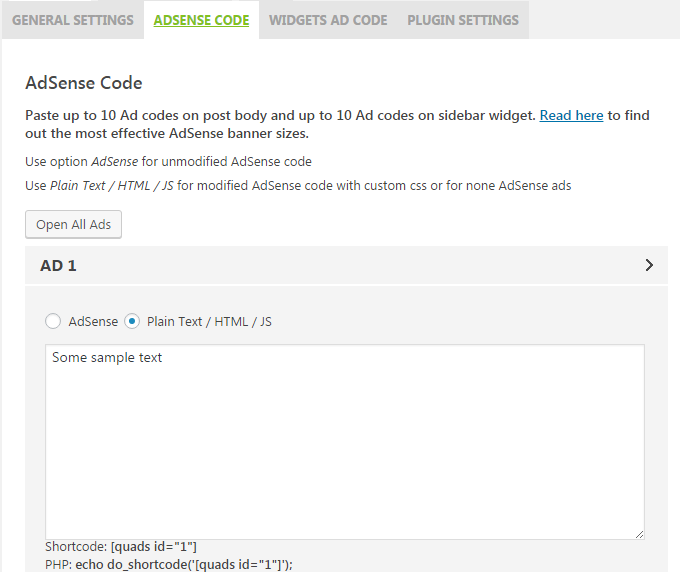 If Google AdSense ads are not visible check first if you are using the correct ad code. Only Google AdSense text & display ads are supported! 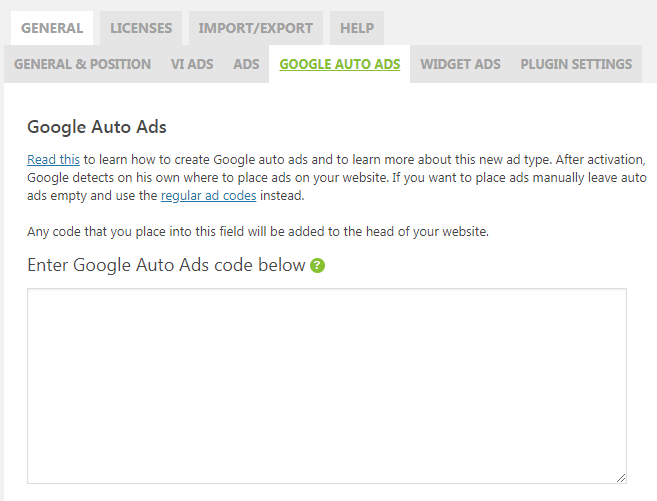 Do not add the ad format ‘Google Auto Ads’ into the native WP QUADS AdSense input field. Auto ads do not give you the flexibility like regular text & display ads do. Auto ads are injected all over your web site where you sometimes do not want them to be. 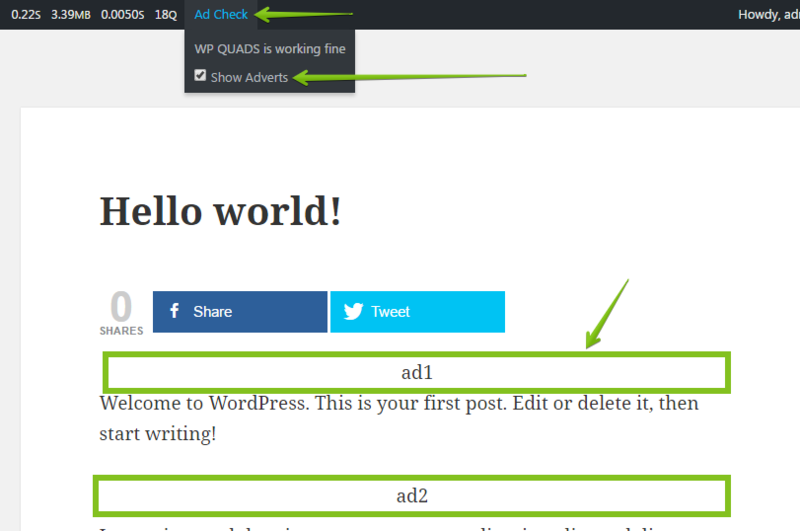 Read here how to create the correct ad code and add it into WP QUADS. Is your AdSense account approved at all? Are there enough potential advertisers for your content? Is the Ad Status Active? Is it approved in the first or second stage of the review process? Is your youtube/blogger/other hosted account already upgraded? Is your ad code entered properly? Are there targeted ads for your site? Is your AdSense account showing any messages or notices? Is the site you put the ads on the same site you applied for AdSense account? Did you Create the Correct AdSense Ad Code? In your AdSense dashboard you need to select the ad unit text & display ad. Do not use one of the native ad formats for WP QUADS. If you added the ad recently with WP QUADS to your site you often just need to wait 1-3 days more until the ads are shown. Is the ad code injected into your site? Check out if the ad code is injected into your sites source code. Select the AdSense option for using AdSense and do NOT use Plain Text / HTML / JS one input form. If the ad is not visible you first need to find out if the plugin is working as expected. Sometimes you notice ads are shown on one of your pages but not on other pages of the same website. There are also no errors in the browser console. It’s possible that google is not showing ads there because the page is lacking enough content or there are no targeted ads available. Its also possible that there is no advertiser who likes to advertise on your site for several reasons. Add this add into your site. If there are no ads available you will see a background colored empty space instead a white spot from now on. If that’s the case you can try to use another ad format or add some more content on the page. Wait a few days and check again if ads are shown than. If you find this code WP QUADS is working as expected and the ad code is injected into your site. The reason why you still do not see the ads rendered on your website could be that either the ad code is broken or not activated by google at all. Than go to GENERAL SETTINGS and assign Ad1 to any position you like to use. 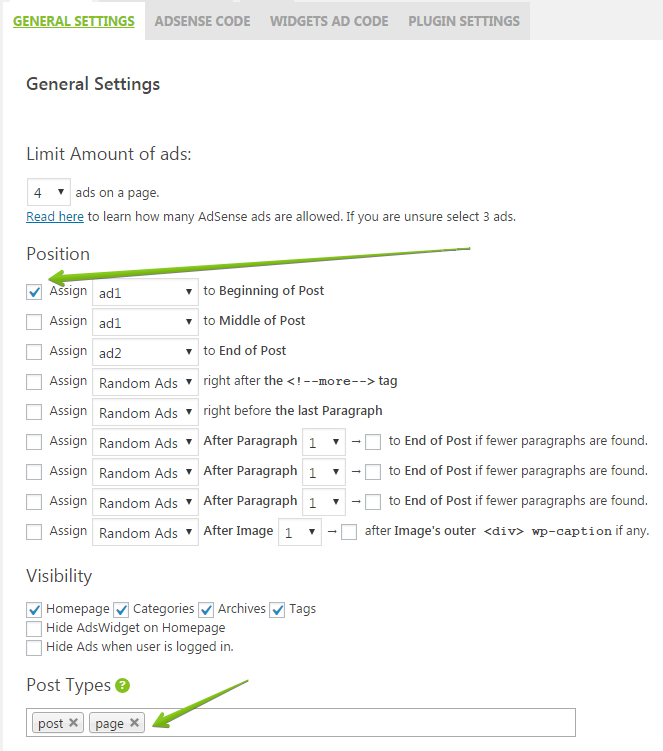 Do not forget to activate the setting Post Types to specify where your ads should appear on your site. Save it and open your website frontpage. The text “Some sample text” should be shown now. If it isn’t shown, there is some issue with WP QUADS and you can open a support ticket. so we can help you to fix the issue asap. For example it can take up to a few hours until Google AdSense ads are shown on a fresh website the very first time. It can take up to 24 hours before ads are appearing on your site the first time! Another problem could be that your website has not been granted for the AdSense program or it just take some more time until ads are shown. 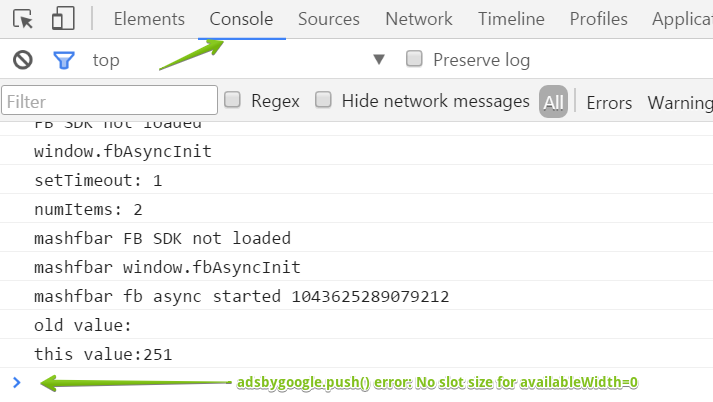 Open the page where the ad should be visible and activated and open in Google Chrome the developer console with pressing the F12 button. it means you are using the responsive AdSense ads and responsive ads are not supported by your theme by default because AdSense can not detect any available free space around the ad for rendering it. To check if your issue is affected by this issue you can specify a fixed size for the adsense ad. Use the size 300 x 250. That’s the most common size and chances are good that there are relevant ads for this ad size. Save it and check if the ad is shown on your site. If that’s the case you can specify various fixed sizes for all your devices to bypass this issue. Use the Advanced Options of WP QUADS PRO to do so. If you get any other red colored error message you can open a support ticket with sending us the error message and we can assist you with resolving it. If ads are not shown and the ad type is the responsive one it’s possible that your theme has issues with showing responsive ads. To find this out try to place the ad code into the plain text form of WP QUADS or use a fixed size for it.